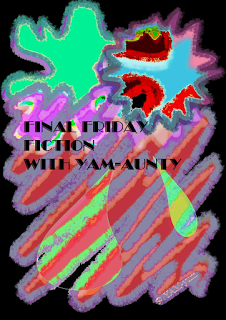 NOVEMBER FINAL FRIDAY FICTION BLOG HOP. 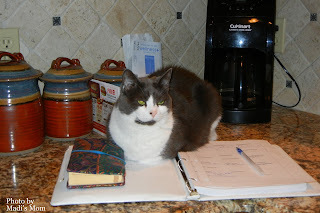 I have my pen and paper ready and a pot of coffee! Take a favourite book and go to page 87; take a section from lines 8, 12 and 16.
using those phrases as a prompt, build a story around them. It can be either prose or poetry. The phrases do not have to appear in your tale in the same order as they were extracted from the origin text; but they ought to remain 'intact' so that they can be recognized upon reading them. Now grab a cup of your favorite hot beverage and find a cozy chair. this book is about a dog named Winter; however by these lines I found on page 87, you'd never know it. It was late November, a biting rain was falling and the threat of sleet. Driving on the country road took every ounce of concentration. Even so, the four friends always met for a supper each month on the fourth Thursday. Each Thursday was planned months ahead but the location was only disclosed a few days ahead of the supper. With Leonora's flair for attracting men, Sue thought it wise to select an out of the way venue on the outskirts of town. Sue hoped that soon Emil would be too busy at work to hound her for a location. Emil liked to keep an eye on Leonora. On the appointed night at the precise time everyone arrived. Everyone quickly took off their slickers and Wellies. Air kisses and hugs were exchanged. They were escorted to a lovely table in a quiet corner. The orange glow from the fireplace was quite welcoming. Everyone complimented Sue on the venue. They each reached for a warm homemade roll and homemade cinnamon butter. As they each bit into the warm roll, they knew the evening was going to be a smashing success. The waiter handed them the menus, a long speculative stare was exchanged. They could not read a word. It was written in Emoji symbols. HAS NO BRAIN AND SHE FORGOT TO TAKE PHOTOS LAST WEEKEND!! BUT TRUST US..PLEASE...THIS IS A DELICIOUS AND SIMPLE RECIPE. This recipe came from Family and Food magazine 2007. "Eyes light up when I place this crispy and flavorful side dish on the table"! Bake 30 min: turn potatoes, bake an additional 30 min. I turned them then sprinkled with cheese and only cooked 15 more minutes. Oh WoW! What a great story, culminating in a great tater recipe! Double Yummies!!! Love your story and will have to try the potatoes. I actually have all the ingredients at the moment. Bwhahaha - emoji symbols. Oh those poor ladies! What a fun story. Very interesting tale. That recipe sounds so yummy for the Sweet potatoes. You all have a super Friday. How we loved Winter's Tale♥ Your potato recipe sounds delicious! That is an awesome story! Happy post-Thanksgiving. That was a super story and that potato recipe sounds delish! Bravo for a wonderful story! You did such a great job with your writing - you are a lot braver than Mom was. She decided to read what others created:) What a nice surprise twist at the end!!! That recipe sounds easy and tasty. Mom loves sweet potatoes, we may just find her trying it out. OMD...what a wonderful story, Mama is still giggling at the ending!! As for those potato spears, we are going to make sure Mama shares when she makes them! That was a wonderful story!! Loved the surprise ending especially - BRAVO TO YOU AND YOUR MOM! Also that potato recipe sure does sound good....we knew we'd get lots of good recipes this month because my Mom is a POTATO LOVER EXTRAORDINAIRE!!! What a fun challenge. This is the first time I remember hearing about it. Great story - with an even better ending. Great story Madi, and a delicious sounding recipe. Fantastic story Madi! Mom loves the recipe and is printing it out....sorry there is no picture though. What a wonderful story to enjoy while eating those taters! Our mom lover taters! That was terrific pretty Madi but for some reason I'm hungry now! The mom thinks that tater recipe sounds so good. She's definitely gonna try this one. We've been finding a lot of good tater recipes today. You have some great writing skills! I think it is very difficult to take phrases and certain words and plug them into a story that you write and have it come out. Interesting story you wrote. I enjoyed it. We WILL be making the potatoes!